Forgive my slackness, the blog hasn't been updated since April. So much to tell. Where to begin..? Well, for starters Max has gone to a fantastic permanent home in Wilderness. He recovered 99% from the mange and his leg is almost normal, he left a well behaved, obedient, happy and healthy dog. Job done! To bring you up to speed on the bits in between.... 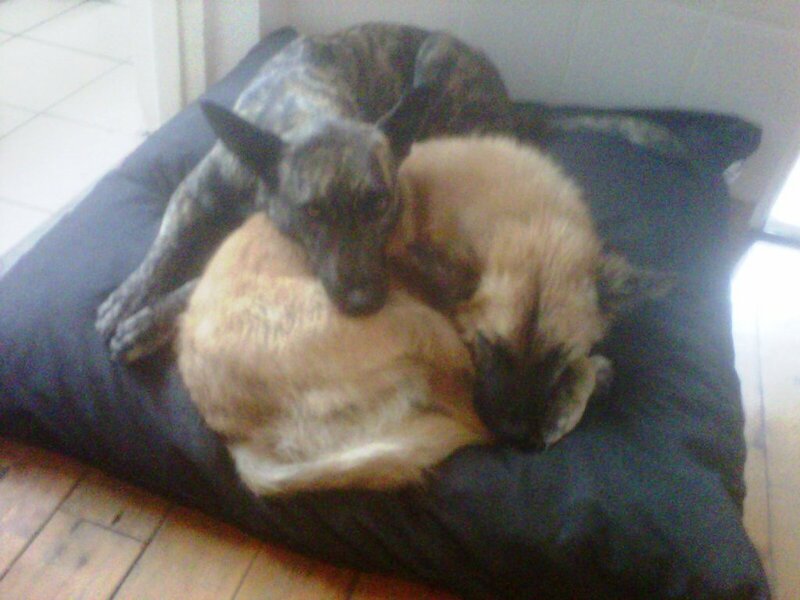 The last post was about the arrival and departure of the big German Shepherd, she moved on, went to a family in the Strand, I believe it didn't work out and she went on to another home, sadly I heard she died of Billary a couple of weeks ago. Shame. Max enjoyed having some company, so I took in another foster in May, a 2 year old female 'Royal African Hunting Dog' called Shenzi. She was a family pet and for some reason or another was dumped at the SPCA. 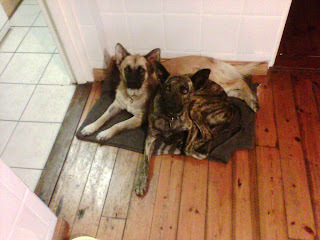 Here they are chilling in the kitchen. Shenzi was very nervous when she arrived but settled quickly and got on nicely with Max, they had a bit of an issue about who was going to sleep in the big kennel but Shenzi quickly showed Smelly who was boss. Thats how it stayed. She had a few bad habits, like getting on the furniture and climbing up in the kitchen to nick food off the counter (including a delicious chorizo pastry from the Biscuit Mill which my housemate was looking forward to eating!). These were resolved quickly. Her digging and barking were not so easily resolved, my garden is trashed and I am in receipt of a letter from a whinging neighbour. 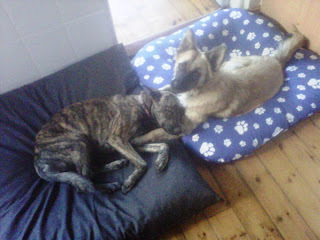 Shenzi barked at the builders next door (fair enough) and also barked at the neighbour and her ratty little dog. The builders were terrified of Shenz and wouldn't dare set foot in my garden so she was good for security. Shenzi was the most unbelievable athlete and it was magnificent to see her running at speed, she was fast and agile and her hunting instinct was incredible. She was happiest chasing birds, squirrels and occasionally small dogs. The dogs had a good life, I walked them everyday after work in Keurboom Park and they got plenty of time on the beach and mountain (which Shenzi enjoyed immensely). Here are a few pictures of their adventures. The last one shows how good Smelly's fur ended up! I was really happy to hear that a lovely family in Wilderness wanted to take them both. As far as dog homes go it couldn't be better, a big garden full of wildlife for them to chase, access to forest trails, close to the beach and a family who genuinely love dogs. They went last week (Monday 18 July), it was very sad to see them go but I am happy that they have gone to such a nice place together. Their new family phoned me on the weekend and the dogs are having a jol! 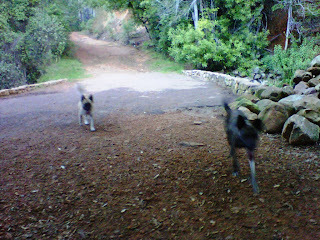 So... that wraps up Smelly's story... here is a final picture of me and the mutts on Noordhoek beach. I decided to take a break from fostering dogs. Which lasted all of 6 days. I now have a mum and her 7 puppies living in my granny flat. I will blog about them too... come back tomorrow for an update. Wow, you really do such fantastic work! So truly incredible! Can't believe Max is the same dog. you did very good there.